Technically, Badlands National Park was the first national park I ever visited. My family visited here on a road trip in the late 70’s. I’ve visited several times since then and it never ceases to amaze me. 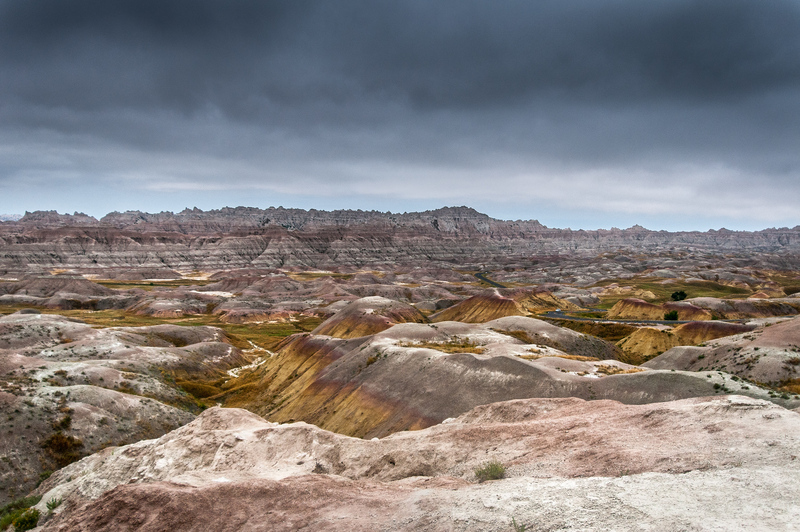 What makes Badlands special is its colorful landscape. The erosional features of the park are actually the remains of an ancient volcano explosion from Yellowstone National Park. Multiple eruptions deposited multiple layers of ash which created the colorful features we see today. In addition to the stunning geology, Badlands is also the home to a large mixed-grass prairie and population of pronghorn antelope and prairie dogs. Badlands is about a 1-hour drive from Rapid City, SD, which is the location of the nearest airport. It is also near, but not a part of, the Black Hills which features Mount Rushmore and Wind Cave National Park. You will probably also want to stop at nearby Wall Drug, one of America’s classic roadside attractions. 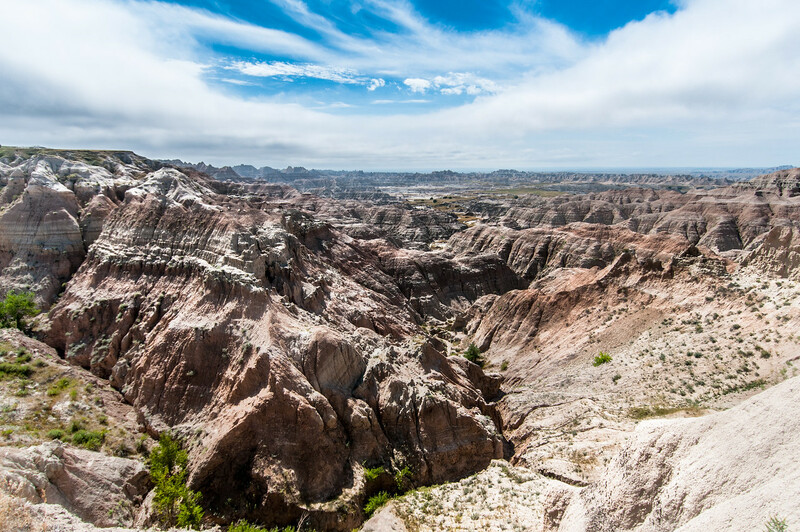 The Badlands Loop is a scenic route that you cannot afford to miss when you visit the Badlands National Park. 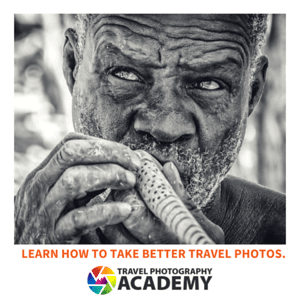 Be prepared to take a few stops for those photos! There are various trails and monuments within the park that are suited for hikers of all skill levels. You will find yourself navigating across a vast prairie land or making your way up the hills. There are three major lookout points in the park: Yellow Mounds Overlook, Big Badlands Overlook, and the Pinnacles Overlook. 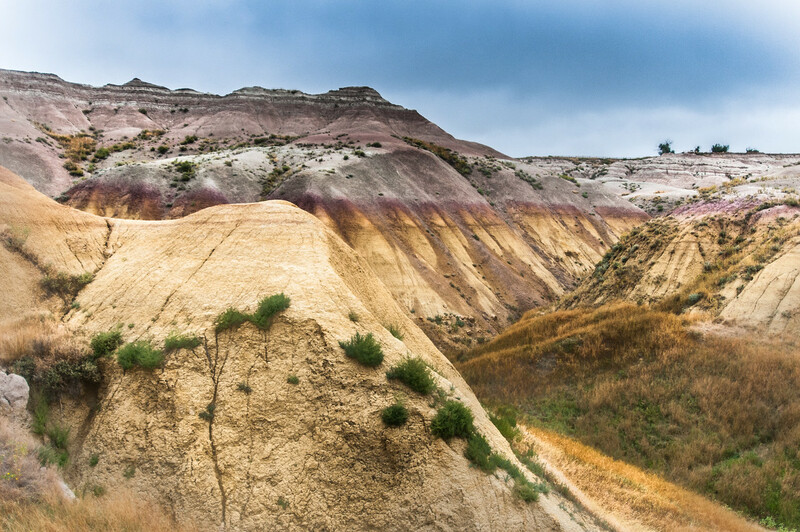 The Fossil Trail is one of the most notable attractions in Badlands National Park. Go back in time as you make your way through the boardwalk. The Wall formation in the park spans 60 miles in length. The wall features sedimentary rock layers that have been exposed due to the erosion activity over many eons. Want to see the prairie animals in their natural habitat? You can head to the Sage Creek Rim Road. View the complete list of North American National Parks I visited.